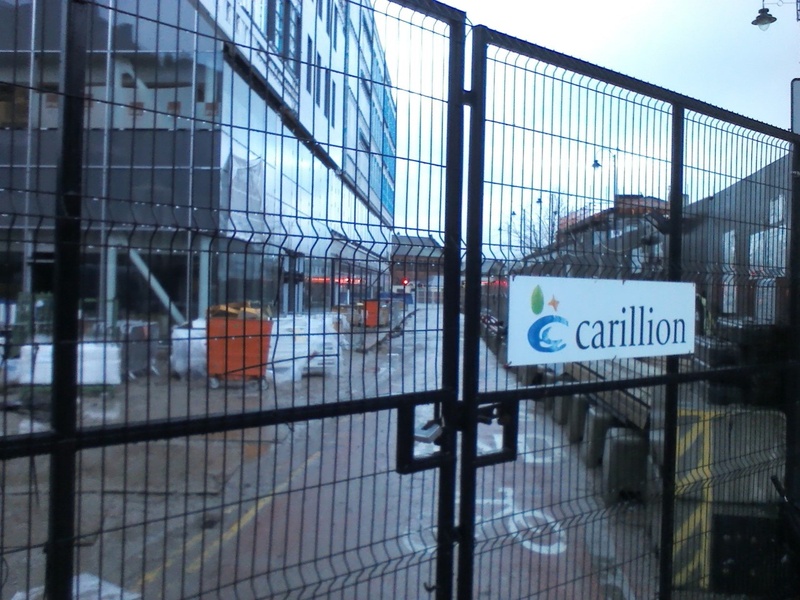 Northern Voices: Carillion collapses! Tameside Council says it's "business as usual." Carillion collapses! Tameside Council says it's "business as usual." It's Business As Usual But Where Are The Workers? If Tameside Labour controlled council are to believed, the one thing that is not in short supply in this crumbling industrial wasteland, is VISION! But given this vision, they were totally unprepared for the predicted collapse of their partner 'Carillion', the construction giant that became insolvent on Monday. Despite the collapse of Carillion, which runs a number of services for Tameside Council, such as school meals, project design and construction, events and facilities management, the council say that it is "business as usual" and that Carillion is continuing to "operate as normal", after going into liquidation earlier this week. 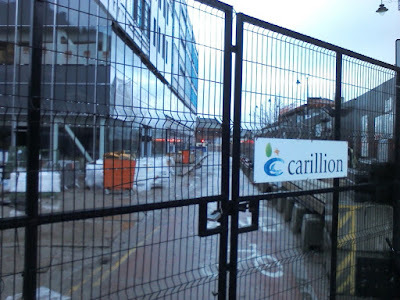 Following the collapse of the "too big to fail" construction company, Tameside Council sent out emails to employees of Carillion working on council contracts advising them that they should continue to report for work and would be paid at the end of the month. Who is going to pick up the bill for this, isn't clear, because the Government have said they wouldn't be bailing out Carillion. Nor is it clear, what the situation will be for Carillion workers after the end of the month. However, the Prime Minister, Theresa May, has said that the government will continue to pay the wages of the Carillion employees providing public services. "The whole thing has been managed unprofessionally - they are like a bunch of Arthur Daley's if you ask me, they really are." As previously reported, contractors who reported to work on Monday, were told by security staff that they were being denied access to the new council office complex still under construction on Wellington Road, Ashton-under-Lyne. However, a council spokesman told the local press that "work would continue on site." When NV visited the site today (Thursday), workers were conspicuous by their absence. A lone security guard, refused to answer questions and scarpered off like a sewer rat up a drain pipe. "Tameside's relationship with Carillion is greater than with any other authority in Greater Manchester." One suspects that few people will be duped by Tameside Council's reassurances of "business as usual" and that worse is yet to come as this fiasco unravels. "Tameside Council sent out emails to employees of Carillion working on council contracts advising them that they should continue to report for work and would be paid at the end of the month. " How does an Authority, who have sub contracted out work, have details of the entire workforce who are employed in providing the construction work and if they do have ALL the details, Why.? Also in passing it is strange to find that Carillion is shown as the Company running Buildings For The Future contracts within Tameside MBC and also Inspired Places Tameside, The Chief Executive Officer of Tameside MBC, Steven Pleasant MBE and the Senior Officer Robin Monk, Director of Place, are both shown as Directors of Inspired Places, Pleasant being a director of BSF. A Carillion Company. Surely this must be a conflict of interest for both, as being the purse holders for such big contracts. As the leader of Tameside's Conservatives Cllr John Bell recently stated, (Ashton Reporter 180118), there appears to be no accountability within Tameside Council,for the granting of contracts to Carillion, no openness or transparency. These are questions that will probably never be answered, because no one will answer them, there is no accountability, openness or transparency.